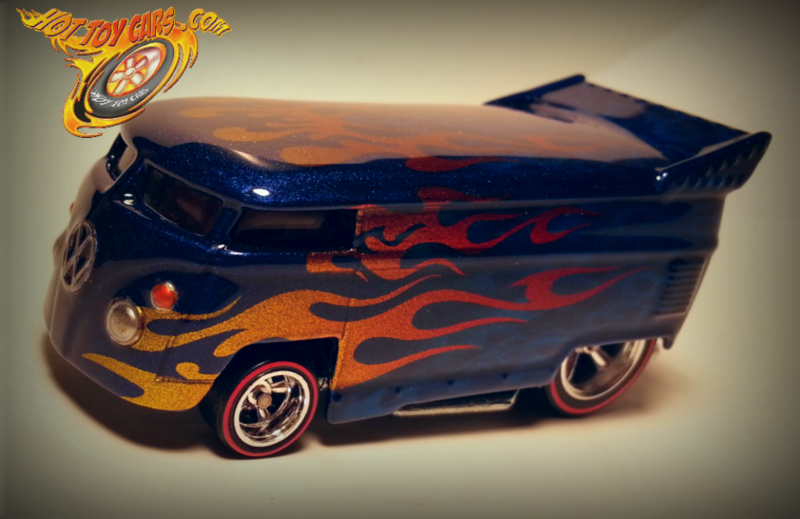 Home / Custom Diecast / VW Drag Bus – 1 of 1 – Candy Fade & Multilayer Flames 100% Paint! 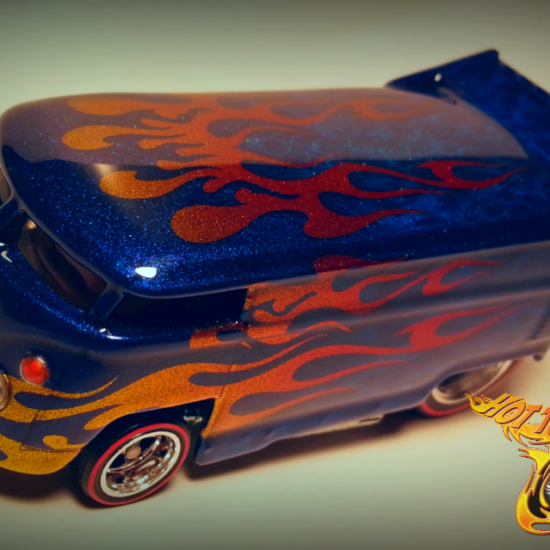 VW Drag Bus – 1 of 1 – Candy Fade & Multilayer Flames 100% Paint! UNIQUE First Run Flame Design! PLUS! 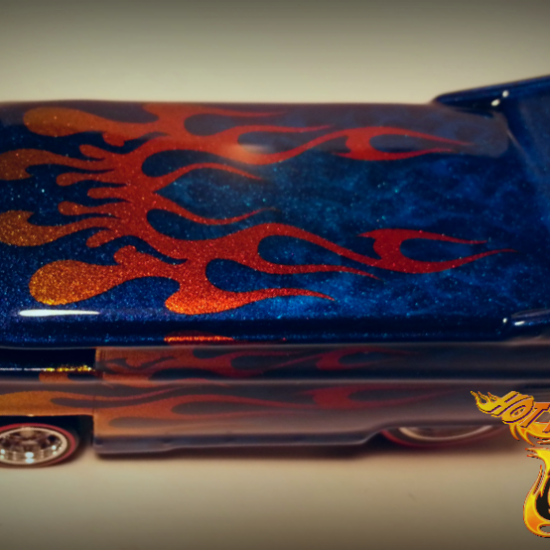 Multilayer Pearl and Candy Blue Flames! 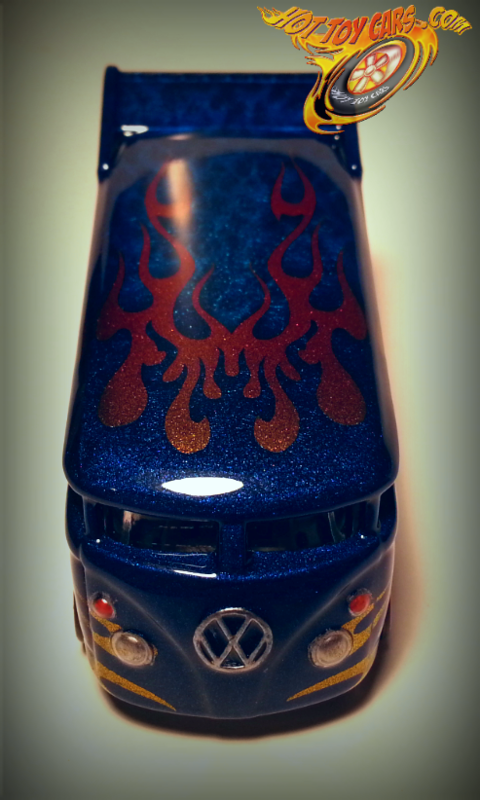 All the original finish was removed, bare metal was smoothed of casting lines. Castings were then cleaned, sanded, and primed with automotive grade lacquer. Then AutoAir Base Coat Sealer was applied and the REAL fun began! 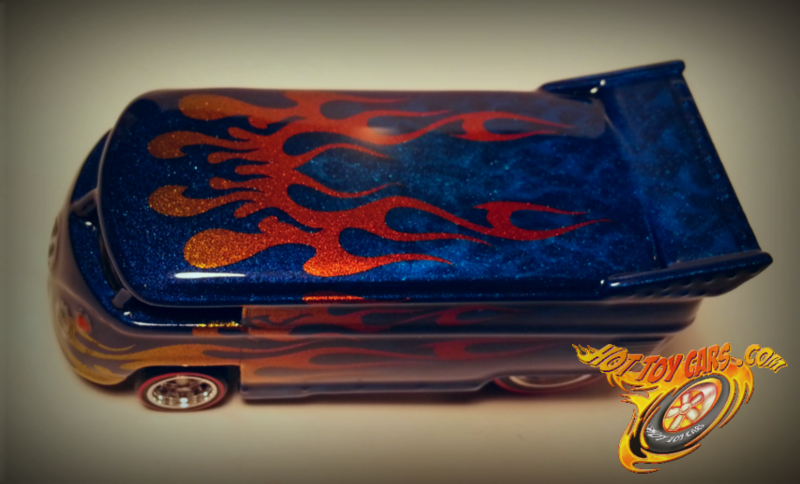 I created a totally fresh “flame in flame” design, which is kind of a “hybrid” in that it combines a couple different flame design styles, plus the licks inside. Very cool design. Custom masks were made. A base color was laid down consisting of custom mixed pearls, HOK Orion Silver, and HOK Gamma Gold for a nice sparkle. Then a seamlessly smooth FADE was applied using Candy Pagan Gold, Candy Tangerine, and Candy Red, then an intercoat clear was applied to seal the fade colors. Then 5 of the new Masks were applied using three different sizes wrapping around nose, behind the side windows, and of course, over the top. With masks securely sealed, the entire exposed body area was given a thin coat of jet black to even the color, then Majyk Blue Pearl, and Galaxy Gray Pearls where faded over the area, front to back and sealed with light coat of SG100 intercoat clear. 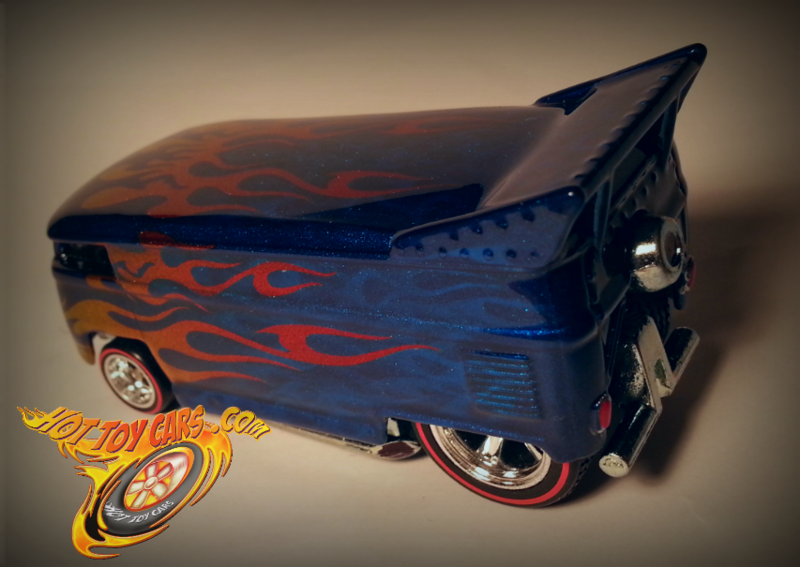 A custom mixed pearl silver was then used to airbrush on the first layer of flames, a light coat of custom mixed Candy Blue applied, then the process repeated one more time using Alclad Chrome for the second layer of flames, and a little deeper candy blue applied over the area. 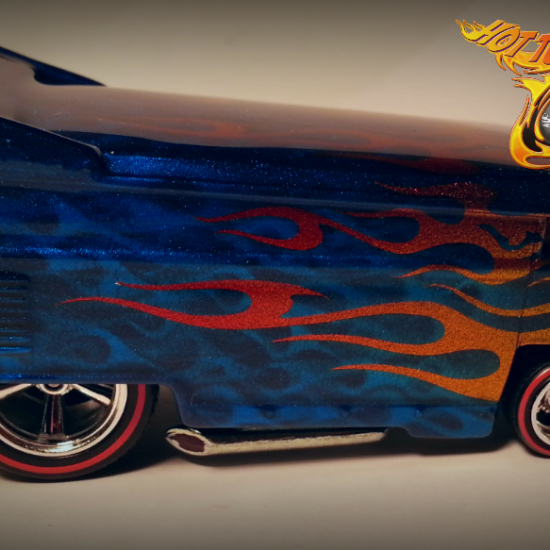 Then the masks were removed exposing the beautiful candy fade flames!! Entire body given three good coats of SG100 clear, and lightly color sanded to even the surfaces. 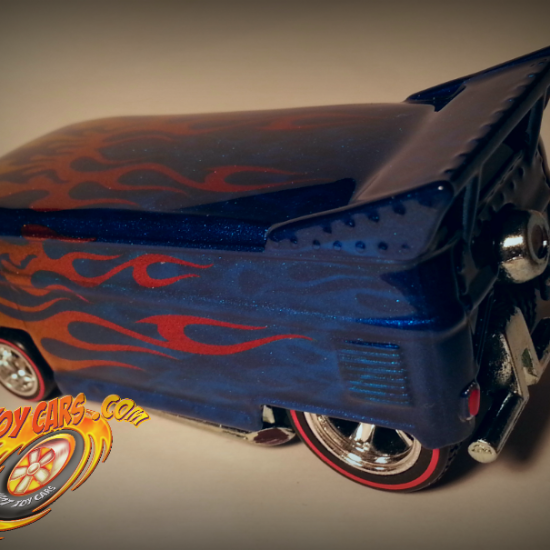 Alclad chrome used for HAND Detailed Head Lights, tail lights, Park Lights, and also added candy red and orange fast to the tail/park lights. 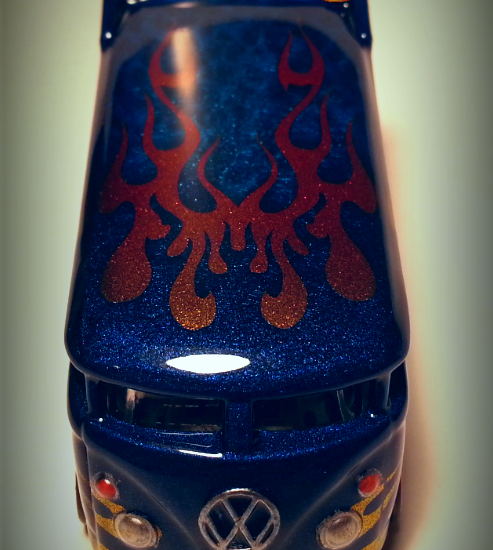 Front”VW” logo done in chrome as well! 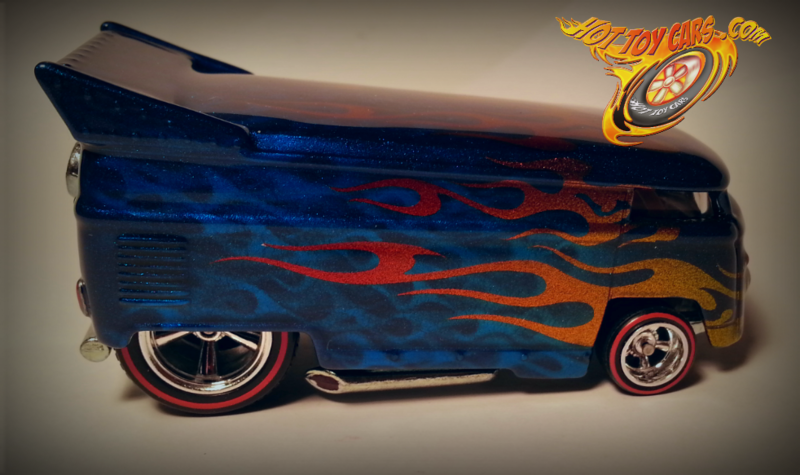 All sealed up with automotive 2part Urethane clear and then HAND POLISHED for a deep gloss and lasting shine! 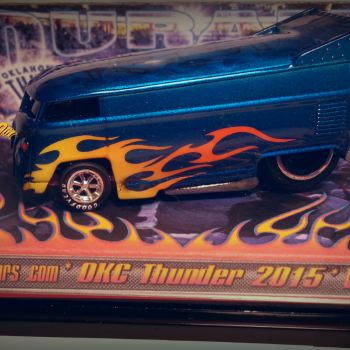 Features Nicely Chromed Metal base and Chrome Deep Dish 5 Spoke wheels with Redline RUBBER Tires ALL Around!! THIS IS A ONE of ONE 100% PAINT piece that cannot be matched!!! 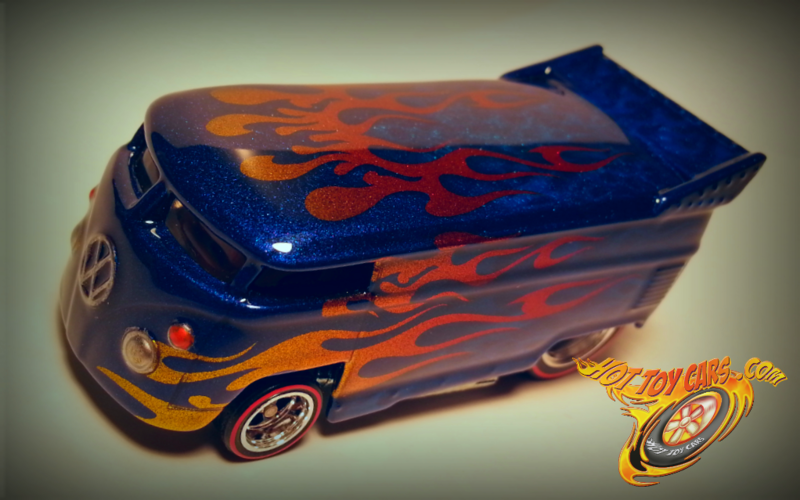 You will not find another Code 3 or other limited series like this VW Drag Bus! 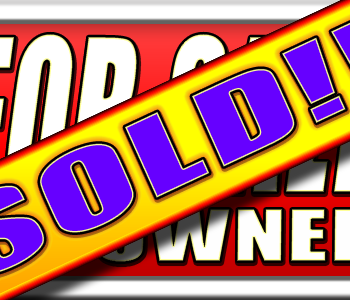 SHIPS within 2 Business days of purchase. Comes mounted in its own acrylic Display case!! Padded and SIGNED shipping box too. Looks super as always, I am learning, but fast enough..
Will have another one of one up by tomorrow! 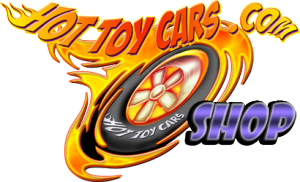 BADBAT Series- LAST 2car SET! 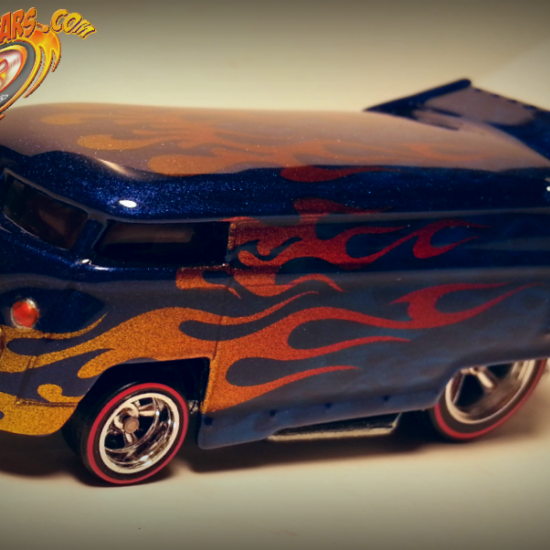 – Batmobile & VW Drag Bus – 1 of 5 – in custom case!